As you likely noticed (we weren’t shy about mentioning it), NextBillion has been conducting a reader survey over the past few months. But as you may not have noticed, the survey recently concluded. In the spirit of transparency that we try to maintain on the site – and because we find the results interesting – we’re sharing some highlights here. We’re still processing these results (there were over 500 responses, exceeding our expectations). 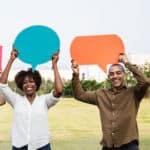 But we’d like to provide our early reactions to these reader responses and discuss a few of the ways this survey data might impact new editorial directions on the site. The first question was straightforward: What sector do you work in? 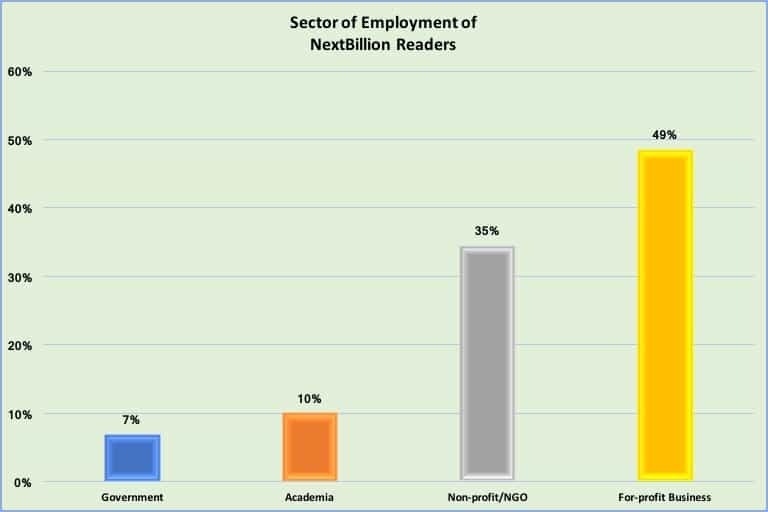 As you’d expect from an enterprise-focused site like NextBillion, for-profit business dominated, with almost half of readers working in the sector. The next question produced a few surprises: When asked what industry their work primarily focuses on, financial inclusion led the way, followed closely by entrepreneurship. Technology and agriculture also scored highly. These results could help shape our coverage in the coming year: NextBillion already has a strong focus on financial inclusion (with a sub-site dedicated to the sector), and entrepreneurship is an element of practically everything we publish. But in light of these responses, we’ll be looking to ramp up our coverage of technology and agriculture – perhaps through special series and sub-sites. And we’ll likely retire our current sub-site dedicated to health care – though we’ll certainly continue to follow and cover the sector on a regular basis. We expected the responses to our question about sectors of interest to largely track with responses to our “sectors of employment” question – and to some extent, they did. But readers also showed a strong interest in impact investing, environment and impact assessment: three sectors we’ll be keeping a close eye on this year. We were also a bit surprised by the response to our question about readers’ professional background. 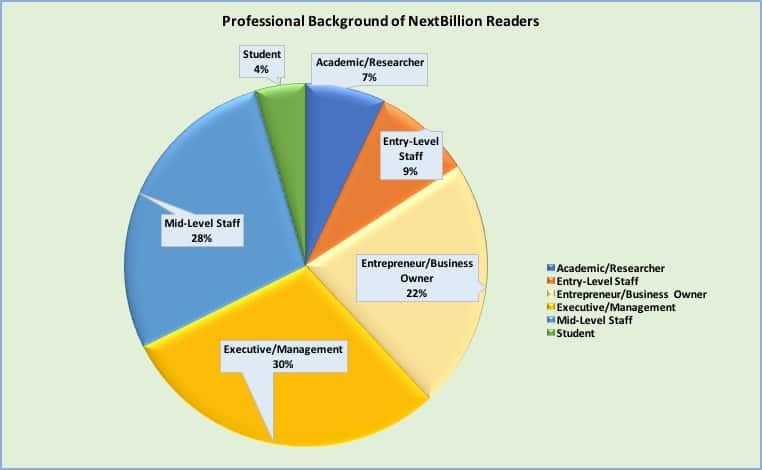 It turns out that over half of our readers are either executives/managers at their organizations (30 percent), or entrepreneurs who own their own businesses (22 percent). 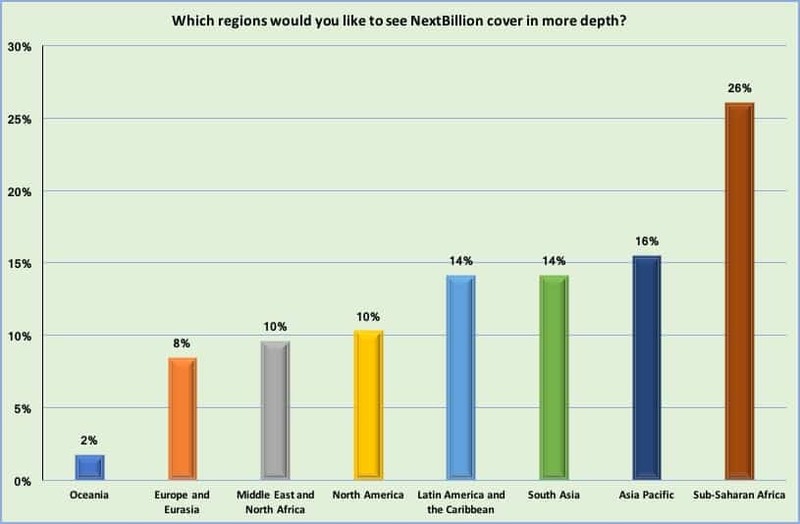 We’ve long had the sense that NextBillion reaches many decision-makers in emerging markets business – this survey seems to confirm it. We were a little apprehensive about asking how often readers visit the site: No publication wants to discover that its readers are disengaged. 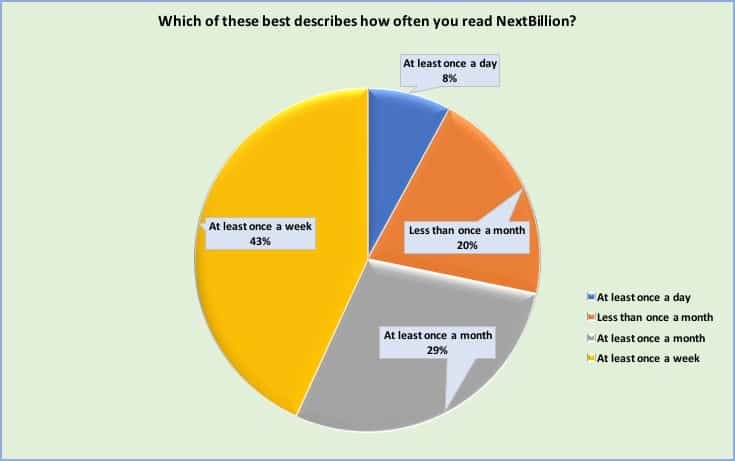 But we were happy to see that a majority of NextBillion readers visit the site regularly: 43 percent at least once per week, and 8 percent at least once per day. Our challenge, based on these numbers, is to try to bring the rest of our readers – particularly the 29 percent who visit at least once a month – into more regular contact with the site. In the coming months, we’ll be experimenting with a number of approaches, focused on both site content and promotion. 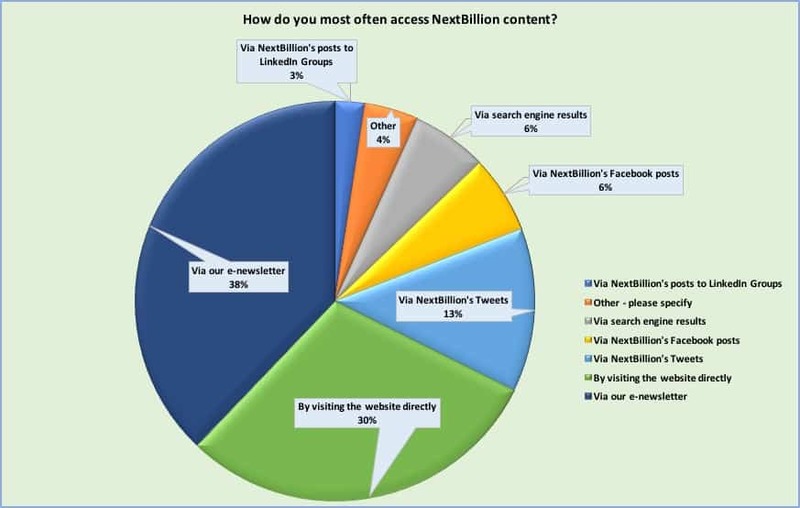 There’s one big takeaway from our question about how readers access the site: Our newsletter, NextBillion Notes, is key, with almost 40 percent reporting it as their main avenue to our content. We’ll be rolling out some new approaches to design and reader engagement in our newsletter in the coming weeks. If you’re not already subscribed, sign up here. As for social media usage, we were rather surprised that LinkedIn was the top platform used by our readers. At 26 percent, it outscored runners-up Facebook (22 percent) and Twitter (20 percent). We’ll be looking to optimize our strategy for all three platforms going forward. But it’s safe to say that we won’t be developing a presence on Pinterest, Medium or Reddit, none of which seem to be widely used by our readers. When we asked about the site features that readers view the most, to our surprise, topical series were the top response. 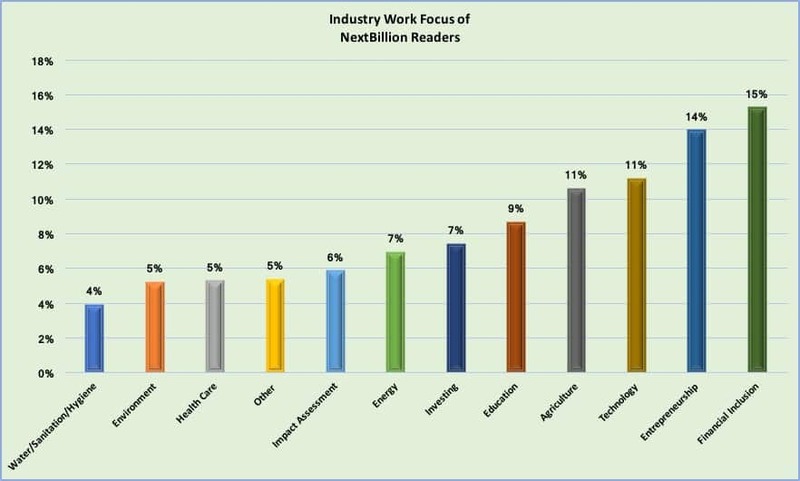 This data was strongly supported by responses to our question about the types of content readers would like to see more often: Series again topped the list, followed by Q&As with thought leaders and analysis/opinion pieces written by NextBillion editors. So expect to see more topical series on NextBillion in the coming year – above and beyond our current 2019 special series – along with more Q&As (and the occasional editorial written by our team). We’ll also stop producing podcasts – the format never really took off for us, in terms of listenership, and the survey confirmed this overall lack of interest among our readers. So our future Q&As will be text (and occasionally video) based, not audio – though you’ll still be able to access our existing podcasts on the site. Our question about readers’ regions of interest also led to some decisive results: Sub-Saharan Africa dominated, a full ten percentage points above the runner-up, the Asia Pacific region. We’ll be ramping up our already robust coverage of Sub-Saharan Africa, seeking more insights from the Asia Pacific – and also expanding our coverage of Latin America, a sleeper favorite that tied with the much-covered South Asia region for third place. On the topic of the quality of our current content, we were glad to see broadly positive responses. Readers agreed strongly that our articles are written by credible authorities in their fields, are engaging and address the topics they care about most. 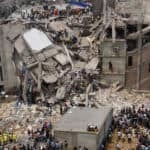 The least positive response came from the question about whether NextBillion provides information readers can’t find anywhere else – something we expected in light of the growing number of social business websites. Readers really value the diversity of voices and viewpoints on the site, and the relevance of the content to their work. They view NextBillion as a place for both hard-hitting opinions, and on-the-ground insights from actual entrepreneurs working in emerging markets – two areas that we feel distinguish the site in the crowded social business media space. They find the articles to be detailed, thought-provoking and engaging – “professional but approachable,” as one reader put it. They value the different features available on the site, including updates on upcoming events – and especially our jobs board, which many find to be a uniquely valuable resource. We’d like to thank everyone who participated in this survey: We’re very excited about these results, and we’re looking forward to putting them to good use as we fine-tune the site’s content and design, this year and beyond. As always, if you have any feedback on how we could better serve your needs as a reader, please contact our editors – we’re always happy to hear from you. Image courtesy of Vek Labs.